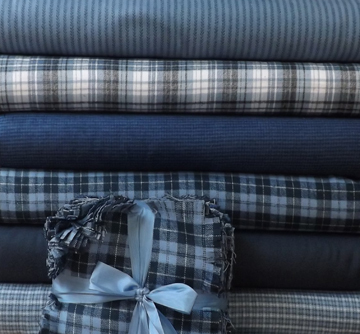 This flannel collection came in last week. We're offering raggy shaggy kits a bit larger than we usually do with the idea that this would make a great quilt for a man. Very nice quality flannel. Join us on August 20th when Karen will demonstrate the many features and benefits of the new BERNINA Q20 sit-down longarm machine. Where does the time go? We’re turning four already! Join us on Saturday, August 22 for gourmet cupcakes from The Pie Maker Bakery and a chance to win one of four $40 gift certificates. Join The Strippers and make a Jelly Roll Quilt from the very popular book Jelly Roll Jambalaya on the second Friday of every other month. We will work our way through all nine quilts in the book, but you don’t have to attend every session. Pick and choose or make them all. This great book also includes fully-illustrated Le Petite lessons and helpful tips related to the projects. In August we’ll make the second quilt in the book. Think of everyone you know (in addition to yourself, of course!) who would love to have one of these cute aprons. Perfect for anyone who needs small items at their fingertips . . . a server in a restaurant, an artist, quilter, cook, hairdresser, child doing a craft project, and the list goes on. 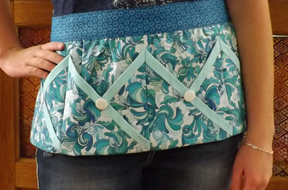 This pattern also includes a matching potholder, bag to hold a batch of prepared cookie mix, and a recipe. 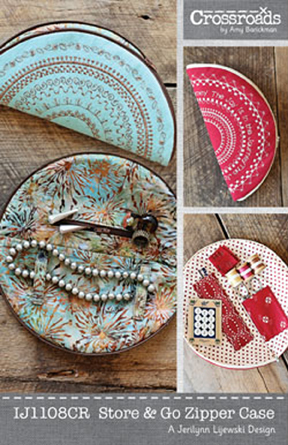 The three items together would make the most perfect hostess gift. Judy Bryan will teach this class. See all three samples at the shop. Check out the full class schedule here! We're working on our fall/winter class schedule and it's going to be packed with new and different options for our customers. Our plan is to have youth classes on Wednesdays, ongoing series-type classes on Thursdays, and a variety of one- and two-day classes every Friday and Saturday. In addition, Beginning Quilting will now be offered on both weekdays and Saturdays. Keep an eye on the newsletter for details. If you're interested in teaching at Cortez Quilt Company, please e-mail Karen with your ideas. We will continue to offer Open Sewing Days each week on Monday and Tuesday. We won't schedule classes or other events on those two days so that the classroom will be consistently available for anyone who wants to spend the day sewing. Join us any Monday or Tuesday for Open Sewing. It's free and fun. 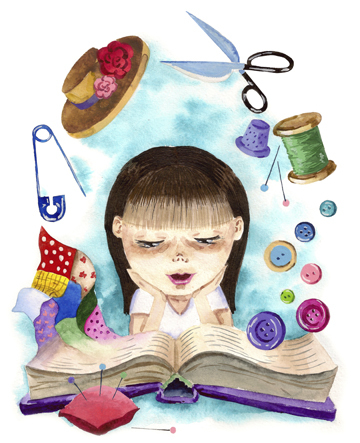 Bring a friend or organize a group for sewing. Do You Offer Quilting Services? At least once a week someone calls or comes to the shop asking about services we don't provide such as . . . If you offer one or more of these services (or something similar) and you are interested in referrals from Cortez Quilt Company, please e-mail us with your name, phone number, what you offer, pricing, and any other details you'd like to provide. We'll keep a list at the shop so that we can assist customers in need of these services. Thanks! Time: 5:15 – 7:30 p.m.
Go full circle! The humble circle is the most perfect geometrical form there is and it’s perfect for for embroidery motifs. Join Sylvain from BERNINA (who is a very fun teacher) and learn how to create circular embroider designs that you can use as center pieces or for practical objects like this circular zipper case. Please call 970-565-7541 or e-mail Cindy by noon on Tuesday to reserve your space. 1. Go through your UFOs and make a list of which ones you want to finish by when. Give yourself permission to decide that you'll never finish some of them and either donate or toss. 2. Schedule a sewing day with friend. Remember that you can always come sew at Cortez Quilt Company any Monday or Tuesday, 9 am until 6 pm. 3. Clean and oil your sewing machine and give your sewing table or work area a thorough dust/polish. 4. Start a new project that's different from what you usually do. If you always make quilts, try a tote bag. Tired of making wall hangings? Dive in and make a queen size quilt. 5. Purchase one new practical tool to replace something that's seen better days such as a cutting mat, rotary cutter, or box of straight pins. 6. Organize a "clean your sewing room" challenge with several friends. Set a target date to finish and wrap up with a tour of each of your spaces complete with a scrap/stash exchange. 8. Attend a quilt show. There are shows coming up in Durango and Silverton in September and in Farmington in October. 9. Join your local quilt guild and get involved. 10. Visit Cortez Quilt Company to look for new ideas or, better yet, sign up for a class. As always, thank you for supporting Cortez Quilt Company . . . your local independent quilt shop.